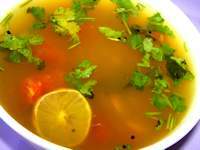 Rasam is a soup made from Tamarind pulp and various spices. 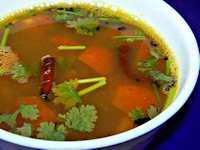 Though it originates from South India, it has been adopted all over India.Literal meaning of Rasam is extract or essence. 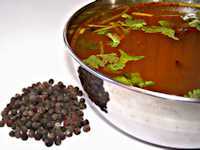 Rasam is a mandatory dish in the traditional South Indian Lunch.It is called Rasam in Tamil and Malayalam, Saaru in Kannada and Charu and Pulusu in Telugu. 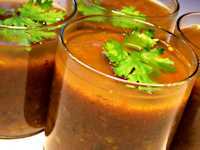 Other popular names of Rasam are Millaguthani, Mulligatawny, Pulichaar and Sathamudu. 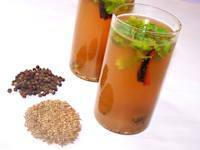 Tamarind juice is the base of Rasam. 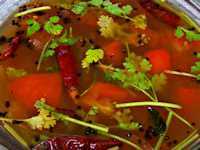 In addition, Tomato,Pepper, Cumin , Chilli , Garlic, and Lentils(Dal) are used. 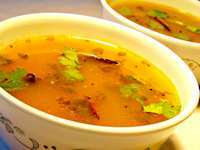 Dal helps to balance the sourness or the spiciness of the soup.Optional Rasam ingredients are Turmeric and Asafoetida (Kayam). 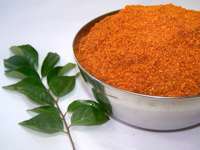 Rasam can also be made using commercially available Rasam Powder. 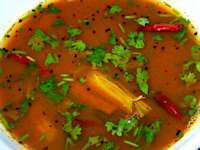 It is prepared by boiling the ingredients with cooked dal for few minutes and by seasoning with fried Red Chillis and Mustard Seeds.